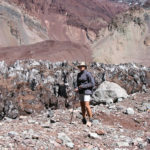 Stand on the highest spot of the Southern Hemisphere and observe the magnificence of The Andes The normal route is technically easy. The hard part is the altitude. This is why we are so careful with the acclimatization. The approach to Plaza de Mulas is a long distance of about 40 km. 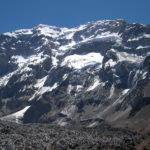 We are also used to making acclimatization trekking to Plaza Francia, the Base Camp of the Southern Wall. It takes us three days to get to Plaza de Mulas. 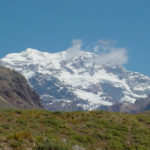 To reach a better acclimatization and to enjoy a unique view of the Aconcagua we will make a trekking to Mt Bonete (4900 mts) . After that, we start the climbing to the Summit. Our suggested program is set for two days of double equipment porting and security. When the last stage begins, we go higher and higher until we reach the summit. 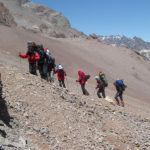 In the Aconcagua , sometimes the presence of a white wind difficults the ascent, this is why we use the security days, increasing the chances to reach the summit. The availability points do not represent people but percentage to complete the expedition. u$s 4900 u$s 4270 (1) 0 Join now Questions? Day 01 · MENDOZA – Altitude: 760 mts. Our expedition starts in Mendoza, Argentina. A representative of INKA Expediciones will be waiting for you at the airport. We will stay at the hotel in the city. A group meeting will follow and you will be introduced to your guides and team members. Accommodation: Hotel double or triple room. – Transportation: Airport – Hotel in Mendoza. Day 02 · Mendoza / Penitentes – Altitude: 2700 mts. After you obtain individual park entrance and ascent permits, assisted by your guide, we meet at our commercial office to finalize all the arrangements of the expedition. Later we travel to Villa de Penitentes, where we stay at a Hotel in the mountain. There we get the equipment ready for transportation to the base camp by mule. Day 03 · Penitentes / Confluencia – Altitude: 3390 mts. We drive you to Horcones Park, where we get our first view of the mountain. We will get our permits checked at the Ranger station. Then, we head off to Confluencia by walking 4 or 5 hours. Day 04 · Acclimatization trekking to Plaza Francia – Altitude: 4.000 mts. We’ve included this day in order to acclimatize better, and give you more chances to summit. 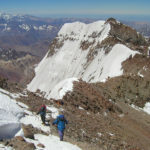 We’ll trek for about 5 hours until we arrive to Plaza Francia viewpoint of the impressive Aconcagua South Wall. This is one of the nicest points of the expedition. 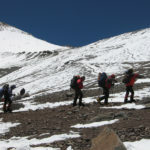 Day 05 · Approach from Confluencia to Plaza de Mulas – Altitude: 4300 mts. After 8-9 hours hiking across “Playa Ancha” and climbing up through a very steep path, we reach Plaza de Mulas, the biggest base camp in Aconcagua Park. By the end of the day, most of us will feel the altitude. The first day in Base Camp is always a rest day and a good occasion to take a bath and explore the local terrain. Day 07 · Ascent to Mt Bonete – Altitude: 5.000 mts. We’ve included this climbing in order to acclimatize better, and give you more chances to summit. 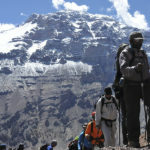 Also you’ll enjoy a spectacular view of the west face of Aconcagua. Day 08 · Rest day at Plaza de Mulas – Altitude: 4.300 mts. We’ll stay in Plaza de Mulas to rest from the climbing of Bonete. We will divide expedition loads to carry to the high camps (community gear, fuel and food). We double carry to keep pack weight down and help ensure good acclimatization. 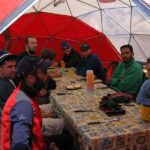 Day 09 · Carry equipment and food to Camp 1 – Altitude: 5050 mts. This is a challenging day where we gain 1.000 m. with a heavy load on easy terrain. Then we’ll return to Base Camp. It’s important to take advantage of the comfort and lower altitude at Base Camp. Day 10 · Rest day at Plaza de Mulas – Altitude: 4.300 mts. This is a day we mainly use to recover energy, to rest, to hydrate ourselves and for abundant meals. 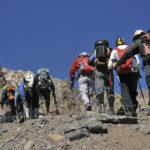 Day 11 · Ascent from base camp to Camp 1 – Altitude: 5050 mts. 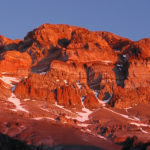 The following morning we definite start the ascent to Aconcagua. We move to Camp 1, called “Plaza Canada”. Until now, we were working on get an optimal acclimatization. We want everyone to have the best possible chance to do summit. 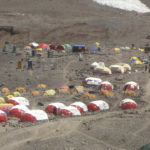 Day 12 · Move to Camp 2 – Altitude: 5.550 mts. 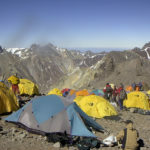 Camp 2, called “Nido de Condores” (meaning Condor Nest), is located in a high pass at 5.400 m. and provides a spectacular view of the surrounding mountains. 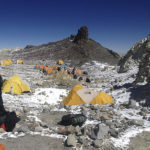 Day 13 · Acclimatization at Camp 2 – Altitude: 5.500 mts. This day is dedicated to improving the acclimatization to altitude. The guide may propose different activities according to the condition of the group. We take the opportunity to rest and give our body more opportunities to acclimatize. 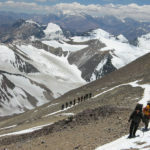 Day 14 · Ascent from Camp 2 to Camp 3 – Altitude: 5970 mts. We start a 4 hours walk to Camp 3, located on the North Ridge. We will prepare our tents and eat and rest, to be ready to get the summit. 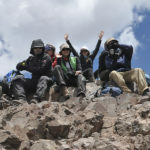 Day 15 · Summit day – Altitude: 6.960,8 mts. It is the most demanding day of the expedition. 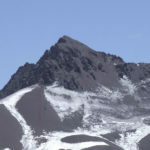 We climb the North Ridge to Independencia Refuge at approximately 6.500 m. We ascend through the “Portezuelo del Viento” , climb “La Canaleta”, and the “Filo del Guanaco”, that leads us to the summit. The prize is waiting for us, a 360° view and the experience of overcoming, that you only finally understand once you reach it. At the end of this experience, we descend to Camp 3. Days 16 and 17 · Spare days in case of bad weather conditions. We have two extra days set aside on our itinerary to attempt summit. These extra days are built in to provide the best possible conditions for each participant to summit. Day 18 · Return to Base Camp. Return from Camp 3 to Base Camp. We’ll enjoy a great dinner to celebrate the experience. 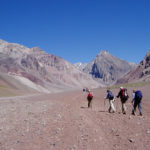 Day 19 · Return from base camp to Penitentes and back to Mendoza. We have breakfast and then start the descent from Plaza de Mulas to Penitentes. There is a private transport waiting for us to take us to the hotel in Mendoza City. 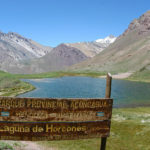 Transportation: Horcones – Penitentes – Mendoza – Accommodation: Hotel double or triple room –Meals: Breakfast, Lunch Box. We have breakfast at the hotel. Check Out and end of services. The proposed itinerary can be changed due to weather conditions o other forced situations that put in risk the group security. The guides have the authority to change the program according to their criteria. You can be sure the changes have two fundamental objectives. These are to maximize the security and the summit chances. And they are based on our guides knowledge and experience. 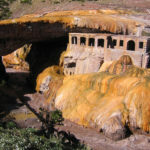 City of Mendoza: Two (2) nights of lodging in a 3 *** hotel in the city of Mendoza, double or triple room, breakfast included. Penitentes: One (1) night at Mountain Hotel in Penitentes, Double or triple, half board, beverages not included. The welcome dinner, breakfast and taxes are included. 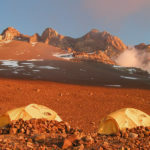 Mountain Camps: All nights of the expedition at double tents or dormitory dome ( 4 or 8 persons) , Full Board. We provide our clients with the best mountain tents available. Also we have exclusive dormitory tents for 4 or 8 persons, with bunk beds, electric light and carpet. We have private bathroom for our clients, toilettes at Confluencia Camp and letrines at Plaza de Mulas Base Camp. We also offered hot water baths at convenient prices. The porter is in charge of helping the group with the extra weight the group equipment represents. 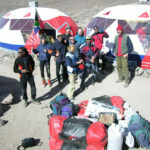 Our programmed expeditions includes the carry of double tents and common equipment. This is to avoid extra unnecessary efforts so you can preserve your energy, for the day you reach the summit. If you need a personal porter you can pay one as an additional. A private expedition is run exclusively for you, your own families or friends and also you can choose the departure date. 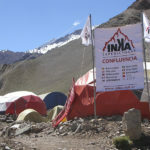 At INKA we have pre-set programs with the same itinerary and services of programmed expeditions. Departure dates: you or your group choose the best date according to convenience. Itinerary: You can choose our pre-set program (recommended) or propose one as programs. 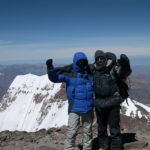 We advise you according to our experience to see if it is feasible to perform so you can reach the summit. 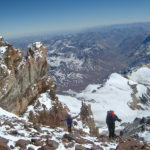 Services: We have the best professional guides and the best infrastructure in Aconcagua. Transportation, lodging, food … no need to worry about anything … just enjoy and get ready for an unforgettable experience. 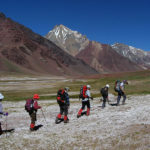 Complete the form below to receive an estimate for your private expedition in Aconcagua! Enter Code into the field.